Silver Contacts Rivets, Bi Metal Contact Rivets, Bimetal Contact Rivets, Tri Metal Contact Rivets, Strips, Silver Wires, Graphite Tips, Silver Contact Tips, Silver Graphite Tips, Brass Assembly With Silver Rivets, Precious Metal contact rivet, Wires, Contact Materials, Contact Assemblies as an active Manufacturer, Supplier, Dealer, Distributor, Trader and Seller etc. (*Importer/Exporter/Service Provider). Electracon Paradise Limited has built and enviable reputation in the field of precious metal electrical contacts and alloys. The Company is known for reliability of its products, high standards of materials and workmanship employed. From the top management to the assembly line, everyone at Electracon Paradise is motivated by company's goal of exceeding customer expectations by supply of quality products. The Companyâ€™s goal is to deliver exceptional quality maintaining high production standards that exceed our customersâ€™ expectations. Our experience and knowledge along with our passion to pursue excellence always keeps us a step ahead of our competitors. 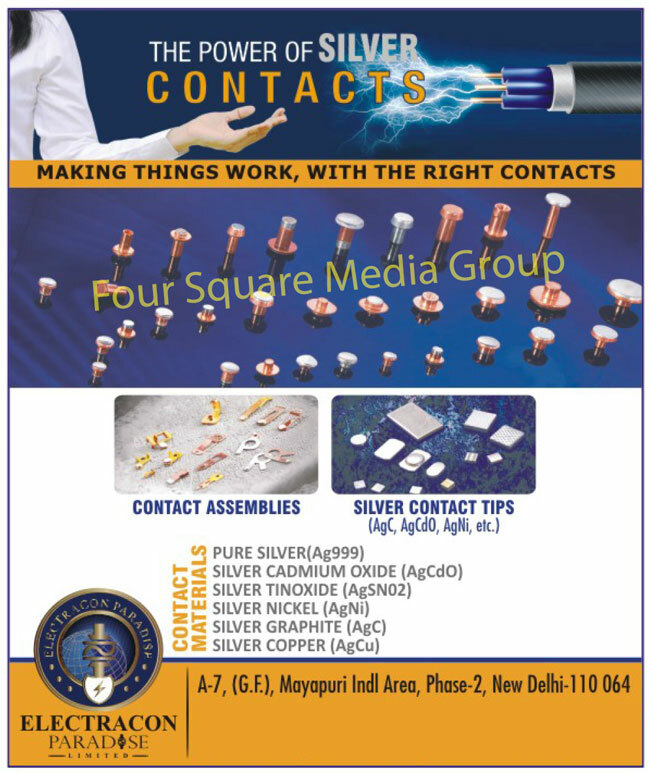 Our high quality products, timely delivery schedules and the ability to manufacture as per the customersâ€™ custom specifications, have made us one of the key players in electrical contacts market.